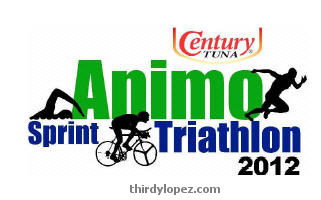 For the benefit of the Saint Jaime Hilario - La Salle School fo the Poor Scholarship Fund and a project of the De La Salle Brothers, Century Tri Hard, De La Salle Zobel & Ayala Alabang Village Association (spearheaded by LSGH Class of ‘81) is organizing Century Tuna's Animo Sprint Triathlon on June 9-10 at Ayala Alabang. attractions await all who come and visit. • Body marking (race numbers) must appear on both upper arms and both legs. • No iPods & mp3’s may be used by the participants during the race. • DRAFTING IS NOT ALLOWED for all participants. a swim loop of 6 lanes (300m). STK will use loops will use Narra, Dao, Molave, and Lauan Streets. Drive (CCD). At the corner of CCD & Acacia, turn RIGHT. Stay on Acacia. University Ave. onto Molave & Narra is a CAUTION and NO OVERTAKING AREA will be allowed. MS and SMS runs will use the re-configured loop which will be announced later. From Transition, take the bridge across the creek to Ma. Christina. Turn RIGHT at Ma. Christina. Stay on Ma. Christina then turn RIGHT at Pagapas, then LEFT at University Ave.
University Ave. onto Molave & Narra is a CAUTION AREA. • PNB (Triathlon Association of the Philippines, C/A No. 1002-3310-0013). Then, fax entry form &deposit slip (clear &/or enlarged copy) with name to: Fax #: 809-3136. Keep receipt & submit during Registration in Alabang. April: STK- P500. * MS/ SMS/ Aquathlon- P900. * Sprint- P1,200. * Relay- P2,700. May: STK- P700. * MS/ SMS/ Aquathlon- P1,100. * Sprint- P1,500. * Relay- P3,300. • No TRAP ID discount. • No Student Discount for STK participants. • Registration forms without payment will not be accepted. Chili Grass and look for Sarita Zafra at Tel #: 889-6794 or Mobile # 0917-8135027.